the best toys and gifts for toddlers! Today we get to feature that lovable age: toddlerhood. Full of crazy fast exploration and lots of change, toys for toddlers need to be open-ended, imaginative, and with lots of options for playtime. Not to worry, these toys will get you through! 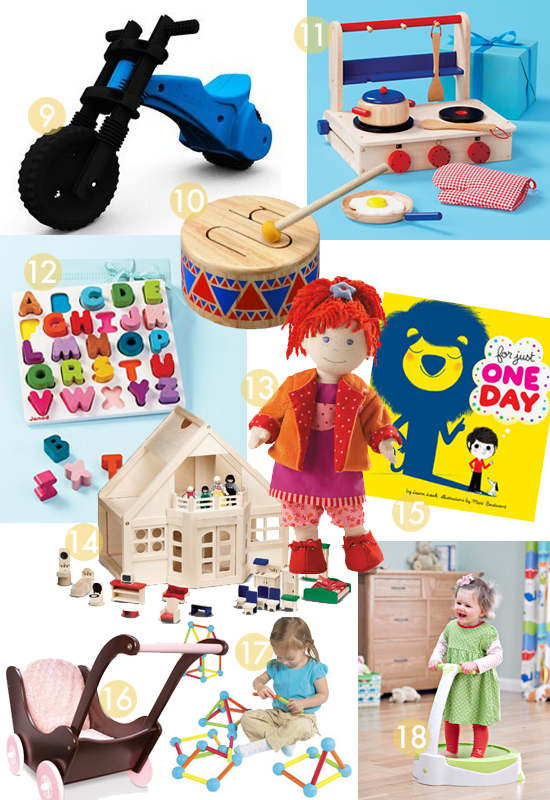 There are many more Gift Guides, and this year’s Guides in the tab above – you’ll find 3 years and over 200 toys and gifts for every kid and every holiday! You might want to bookmark them for later perusing. You’ll also find these gifts in the BRAND NEW handy-dandy SHOP! See that tab at the top of the page? Or click here to SHOP! the toddlers gift guide. The SHOP! will be growing all week long! 1. Flexible Building Blocks, $29.99 – Soft and squishy, but still strong enough to fit together and build tall – these blocks are a great sensory AND building toy for little ones. 2.Moulin Roty Complete Musical Case, $99.99 – This set has everything you need to play with all of your favorite music at home, and it will be used for years to come. 3. Soopsori Fishing Play Set, $35 – Such a beautiful first fishing set, with all natural wood and finishes, and magnet function – it will be magical to play with too! 4. Blabla Balthazar the Magician Bunny, $47 – Definitely one of the new classics, Blabla’s softly stuffed knit toys have an amazing knack for finding the whimsical and the quirky and wrapping it up with a big bow. 5.B.Toys Pop-Arty Beads, $25 – Birdie and I have been playing with these since she was 18 months old – in the beginning we sorted and poured, and now we adorn. These beads are so addictive that I want to wear them too! 6. Plan Toys Carpenter’s Apprentice Set, $29 – What a perfect little tool set for your budding fixer-upper! Wooden tools and a carrying case are a perfect combo for in-and-out play too! 7. Sewing Mouse and Cheese, $19.98 – Stringing toys are such a classic play pattern, but they’re even cuter when they remind you of your favorite food. 8. Picnic Hamper, $80 – Because the holidays are the time to splurge on that one thing that you’ll love forever, this perfect picnic hamper playset will accompany all your tea parties, birthday parties, hikes, adventures, and of course, picnics, like no other set. 9. YBIKE Balance Bike, $80 – Balance bikes are the new way to train your kids to … well, balance a bike. YBike’s version is super kid-tough, lightweight, and a little smaller for the beginners in your life. You’ll love it, you’ll see. 10.Plan Toys Wood Drum, $20 – Yes, I’m a big believer in music education for kids. This drum is a softer quieter way to play with rhythm – and the 3 tones it produces are pleasing too! 11. Portable Play Kitchen, $49 – Pretend play in the kitchen has been a huge part of Birdie’s 2nd year of life, and this portable version means you can take it anywhere (and put it away, natch). 12. Alphabet Puzzle, $39 – This is the cadillac of alphabet puzzles, with extra thick letters for kids to explore. 13. Lotta Doll, $35 – Lotta just whispered to me that she’s soft enough for bedtime and lots of cuddles, with toddler-friendly yarn hair. So, she’s a perfect first doll. 14.Melissa & Doug Deluxe Wooden Furnished Dollhouse, $78 – This could be the perfect first dollhouse, with big open spaces for in and out play, sturdy wood construction and simple furniture. 15.For Just One Day, $16.99 – We love this book both for it’s simple rhyming animal comparisons and Mark Boulavant’s illustrations. At the end, the real mirror is always a perfect surprise. 16. Imaginarium Wooden Pram, $49 – OH my what a sweet little baby carriage! There’s not much more I have to say than that! 17.iPlay Jumbonetics, $27.99 – 27 pieces of first building system fascination – magnets hold these large pieces together. 18. Bubble Bouncer, $79.99 – Man, I wish we’d had one of these over the last year – the ball-shaped base lets your tot jump and bounce safely while holding onto that handle. Think of all that Christmas energy you can burn off! Thank you for confirming my great taste in toys! We bought the YBike for the 2YO at Easter. He’s still a little short-legged for it, so hopefully next spring he’ll be burning rubber. Love the cheese & mouse puzzle – cute find. LOL, glad to know great minds think alike! We have the wooden Wishbone bike and just adore it – you can see it in the SHOP! Woww! Nice toys. Thank you for you guide me in this blog. I will discuss with my sis. which one I want to buy for my nep. Wonderful! Let us know what you pick! Previous post: the best toys & gifts for babies! 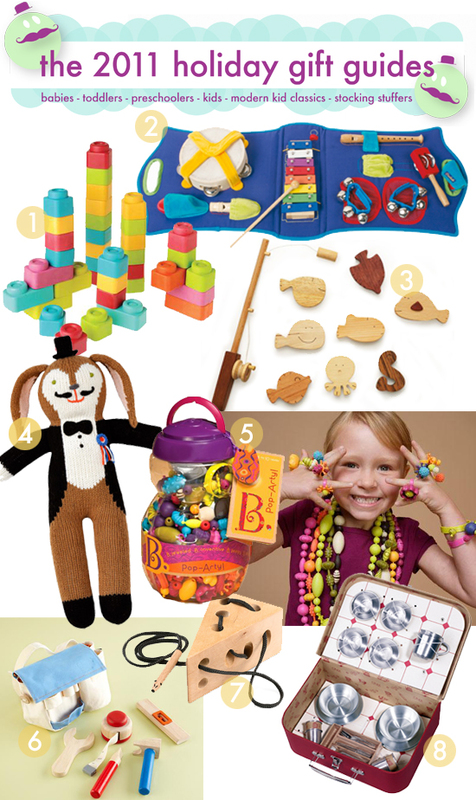 Next post: the best toys and gifts for preschoolers!